Search engine optimization or SEO is a technique in which a particular web site’s visibility is increased. With correct strategy and planning the web site comes on the first page of the search engine when the customer searches the internet with certain relevant keywords. If the site becomes more visible and relevant on than the competitor’s web site then the sales and profitability increases on its own. Primarily SEO techniques are dependent on how the search engine works and the relevant keywords that the prospective customers use for searching. SEO is also dependent on the popularity of the search engine. 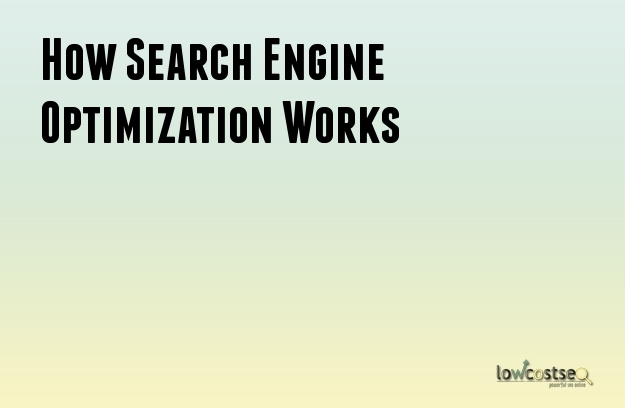 For optimization process the content can be modified and the coding can be changed in order to make it search easy. There are two kinds of techniques- white hat and black hat. The former method is approved by search engines, whereas the latter is not. SEO is majorly linked with keywords in its functioning. Keywords are referred to the particular words or terms that the customers may usually use for searching the web site for certain products or services. Every business web site needs to choose certain specific keywords that are relevant to the services it is offering. The web site is then optimized with those words. When the customer enters those words in the search engine and searches the internet, the particular web site becomes visible to them. Choosing the right keyword is very essential and it is advisable to choose specific broad terms as they are very easy to rank on the search engines as well. Research has shown that the keywords that are ranked easily get the highest amount of page traffic and conversion rate. The major search engines such as Google and Yahoo use crawlers to find the search results with the help of algorithms. The linked pages from the different search engines are found in an automated manner. There are major directories like DMOZ, Yahoo Directory, Google Webmaster Tools, etc that are used for finding the web pages. The crawlers however depend on certain factors like distance and relevance while listing search results. Sometimes the distance of the web page for the search engine also plays a major role in deciding the position of the web page in the search results. In order to increase the visibility or prominence of the web pages certain technique can be used. One effective one is cross linking between the pages of the particular web site. More the linkage, more are the chances of improving the visibility. The content in the web site also plays a significant role in the visibility. If the body or the title of the content consists of the relevant keywords, it can lank well on the search engines. It is good idea to update the content regularly so that the use of the keywords remains fresh and the search engine crawler keeps coming back to it. It is also advisable to add the keywords in the Meta tags of the web site as well. Among the numerous concepts that modern internet age has come up with, one interesting and popular concept is that of Search Engine Optimization (SEO). Though many of you might have come across this term on many occasions, you may not have an inkling of what this concept is about. This article strives to enlighten the readers with vital details about Search Engine Optimization. SEO is basically a process of increasing the viewership or traffic of a particular website or web page in a search engine's organic results. It is often about making those small, yet essential modifications to your website which will help your site to grab more eyeballs. A particular phrase or even a particular word searched over the internet can make a search engine show your website's link in its topmost results, provided your site's content matches well with the matter that has been searched for. To start off, you can do your website's viewer count a world of good by having unique, creative and relevant website titles. You must also make sure that the titles or sub-titles used do justice to the actual content that is reflected on your website. Uniqueness in your site's titles will help your site stand out from the rest. Having a description Meta tag of web pages is also a good thing as it helps search engines to summarily know what your website is all about. One must also give particular attention to the structure of the site's URLs. Simple and easy-to-understand URLs always help to convey the content information lucidly. Likewise, a simple directory structure will organize your content well and make it easy for your site's visitors to know where they actually are on your website. Another important trick of the Search Engine Optimization trade is to improve the navigation hierarchy of your website. A well chalked-out navigation plan, with your homepage as the base, will please both the search engines and the visitors alike. For navigation, the primary focus should be on simplicity and ease of usage. There can be instances where users might come across a page that does not exist on your website, either by clicking a broken link or typing in a wrong URL. For such cases, one should have a customized 404 page that helps the user revert back to a working webpage on your site. After all, the user's satisfaction and experience is imperative in retaining and drawing visitors to your website. SEO is both science and art. It is essential to understand that the goal of SEO is not to circumvent Google’s search algorithms but to learn how to use your website to create value with clarity. Understanding the science behind the algorithms helps us to better fill in the “form” that Google designed to sift out low quality sites. However, the algorithms can never fully capture the complexity of the human minds and that is where the aspect of art fills the gap. Just like how we are being ranked academically, the list of search results is like a leader board where websites are ranked according to the search engine’s criteria. Ignoring the basics of SEO can prevent your website from maximizing its revenue opportunities. If you feel overwhelmed by the concept of SEO, you could always approach a professional SEO company to handle your website. Content without visibility is pointless.